Our study on Markov Chain analysis of mHealth app data wins ISBPNA Best Conference presentation in e&mHealth! Last week we attended the annual ISBNPA conference in Hong Kong, a must for physical activity and behavioral nutrition researchers. The program was packed with interesting presentations of recent e&mHealth research. For the full conference abstract book, check here. Among these studies, our research on assessing how user navigate within mHealth apps, with a case on our own Start2Cycle app, won the Best Conference presentation in e&mHealth award. A great honour and acknowledgement for the steps we are taking towards making more engaging e&mHealth applications! What did we do? We started from the need in mHealth research to have more profound insights into the engagement of users with mHealth interventions and more specifically, the engagement with the apps, games, websites used in these interventions. These tools produce lots of data, but analysis of these logs often remains limited to descriptive statistics, such as at what points in time an app is used, how often a page is viewed and so on. We wanted to go a step beyond this descriptive analysis evaluate the applicability of Markov Models to assess “how” people navigate within certain applications and whether this is how we intended them to be used. As a first case study, we took the data of our Start2Cycle app, developed in the Imec-ICON project “CONAMO (https://www.imec-int.com/nl/imec-icon/research-portfolio/conamo)”. 22 users participated and all details of their sessions were logged. On these data, we then performed a Markov Chain analysis to see how they navigated between the 8 pages. This type of stochastic modeling allows you to identify patterns or make predictions based on the data you have. For us, this implies that we wanted to know how our users navigated within the app. The analysis allowed us to answer various questions on the usability and general use of our app. 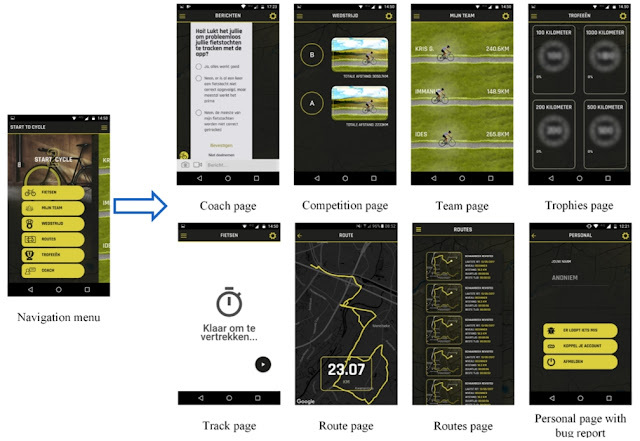 For example: what is the chance that when a user has logged a ride, he/or she will then navigate to the ‘competition page’ to see how this ride aided his/her team in the race with the other team? Or: when a user opens the app, what is the most likely path he will take within the app until exit? From which page do they generally exit the app? The analysis revealed two most likely paths in the app: a tracking session and a gamification sessions. 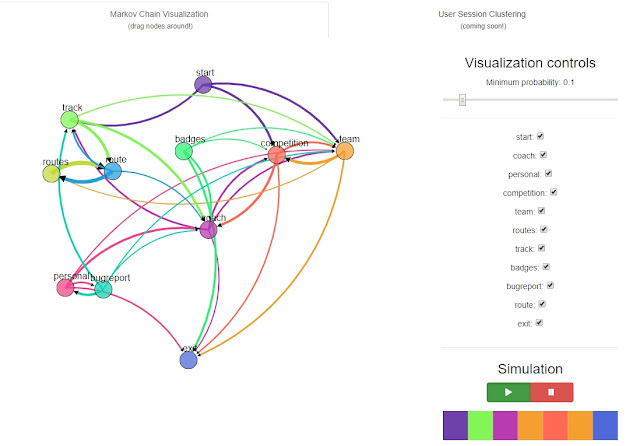 The two main purposes of the app clearly stood out in the visualized Markov Chain. Moreover, by applying a sequence clustering algorithm, this insight was confirmed in an automatic fashion. Great to see! Of course, the app in itself is quite straightforward, but we would like to do more of these and other analyses on complex log data of e&mHealth apps and games. This was just the first (baby)step of what we want to do in the future. So more coming up! One more thing! For those interested in some hands-on experience, we are currently developing a tool to generate a visualization of your data using Markov Chain analysis. Check out: https://ibcnservices.github.io/MCAppAnalysis/. Sample data (your data should be in the right format) of our app, as well as the python code for the Markov Chain analysis can be found on https://github.com/IBCNServices/MCAppAnalysis. Using your own data works as well, as long as it complies to the pre-defined format (CSV file with either 2 columns (from & to) or 4 columns (from, to, session_id and timestamp)). Let us know how it went or tell us if we can help! The ISBNPA 2018 presentation and abstract can be found here and here. Stay also tuned for our journal paper on this research coming up! This study originates from the CONAMO project, funded by the Imec ICON research program with project support of Vlaio. Companies and organizations involved in the project are IMEC, imec-IDLab, imec-MICT-Gent University, imec-SMIT-VUB, imec-Living Labs, UGent-Victoris, VRT, Energylab & Rombit. Special gratitude goes out to public broadcaster and project partner VRT and its team for the development of the app, especially Matthias De Vriendt for outlining the raw data structure and format. Gilles Vandewiele is funded by a PhD SB fellow scholarship of FWO (1S31417N). Jeroen Stragier is a postdoctoral researcher at Ghent University, faculty of medicine and health science and faculty of political and social siences. His research focuses on the motivational affordances of new media and technology for behavior change.